CAP National Chief Robert Bertrand and Minister of Indigenous and Northern Affairs Carolyn Bennett at the Daniels v. Canada symposium. On March 21, the Congress of Aboriginal Peoples (CAP), which represents the interests of Métis, off-reserve, and non-status Indians in Canada, hosted a symposium on the Daniels v. Canada decision. On April14, 2016, the Supreme Court of Canada concluded that Métis and non-status Indians are indeed Indians under section 91(24) of the Canadian Constitution. CAP convened the symposium to spark dialogue between grassroots Indigenous groups and the Canadian government. The symposium focused on how to move forward after the Daniels decision, with thematic emphasis on inclusion and respect. The event featured prominent speakers, such as federal Minister of Indigenous and Northern Affairs Carolyn Bennett, Gabriel Daniels, and a keynote address from former Liberal MP Todd Russell. It concluded with a panel discussion between audience members, representatives of grassroots Indigenous organizations, academics, and lawyers. Bennett characterized the Daniels decision as a step toward reconciliation. “This symposium,” she said, “is the first step in mapping a way forward together. It is the beginning of a dialogue on what reconciliation will look like between Canada and the peoples that CAP represents.” She emphasized the Trudeau administration’s commitment to conducting government relations with Indigenous groups on a nation to nation basis. Her government intends to, “operationalize inclusion and respect” in its future dealings with Indigenous nations generally, Bennett said. Bennett encouraged CAP constituencies to come together with recommendations on how to move forward after Daniels. The government, she stated, would take these recommendations in good faith, would meet often with CAP negotiators, and would facilitate any necessary meetings between CAP and other federal ministers. Gabriel Daniels took the stage and offered his thoughts on the meaning of the Supreme Court ruling. In 1998, his father Harry Daniels, then president of CAP, pioneered the case that bears his name. Harry Daniels died in 2004, but Gabriel assumed the mantle and saw his father’s work to fruition. While reminiscing about his relationship with his father, Gabriel recalled attending meetings as a small child. “Our own people were fighting,” he remembered, “whether over ego or money – I just couldn’t understand.” Daniels brings a message of unity and cooperation to the contemporary discussion. “Please stop fighting,” he implored First Nations, Métis, and non-Status Indian leadership. He was referring to reported conflicts following Daniels over who does or does not qualify as Métis, and to what non-status and off reserve Indians are entitled. Daniels encouraged the symposium to forget about in-fighting, money, and greed. Not all attendees, however, were prepared to adopt wholeheartedly Daniels’s approach or take Bennett’s promises at face value. As the floor opened to the audience, Lisa Cooper, president and chief of the Native Council of Prince Edward Island (NCPEI), took the microphone and told her story. Cooper’s mother was a residential school survivor who helped found the NCPEI, which serves off-reserve Indigenous people from a variety of nations, and is unaffiliated with PEI’s Mi’kmaq bands. She knows from experience the difficulties off-reserve and non-status Indians face trying to access social services and programs. Soon after Cooper took office, she said the Trudeau government followed through on a Harper era initiative to withdraw what amounted to $84,000 in funding from NCPEI’s Native Alcohol and Drug Abuse program. 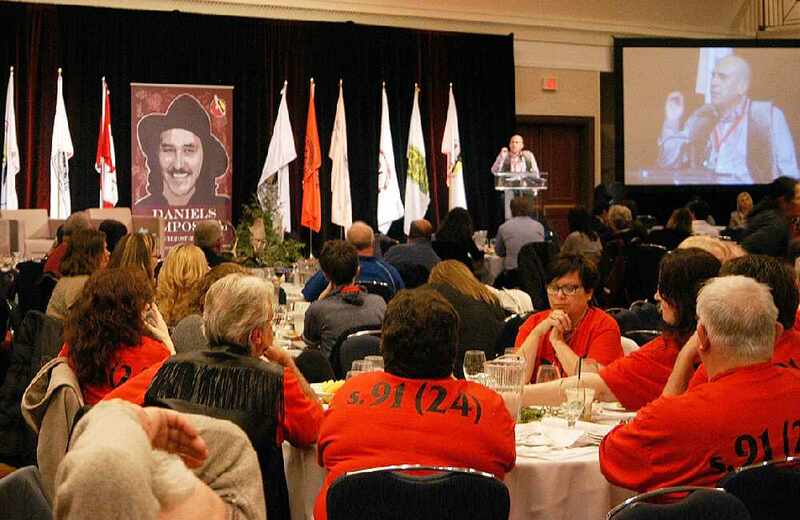 Acquiring a seat at the table for Métis, off-reserve, and non-status Indians was one of Daniels’s major incentive for speakers and attendees. Daniels, he and others hope, grants them that right.